Yesterday brought a very special moment in my running life as I won the Winter Buckeye Trail 50K, finishing in 4:36 a little more than 11 minutes ahead of the next runner. Going into this race, my intention was to cross the finish line first, and actually achieving that goal, regardless of the fact that many of the area’s top ultrarunners were not out there that day, was quite special for me. Thanks to my YakTrax Pros, I ran the trails aggressively and without much concern for the snow and icy sections. To say I suffered would be an understatement. At about mile 13, I hobbled into the Boston Store aid station with horrible blistering on my right Achilles heel from my now retired Montrail Hardrocks. Happily, my friend and fellow SERC member Elizabeth H. happened to be there at the Boston Store (she was passing through in the other direction) and have a blister patch, which I immediately put to good use. Without that patch, my Achilles heel, which looked like hamburger from the blistering, might have taken me down. Unfortunately, the pain of my blistering was only the tip of the iceberg (pun intended). I guess it was the cold (the temperature was about 20 degrees max), combined with my aggressive running and the stress of trying to hold the lead, that triggered agonizing cramps in my legs during the last 10 miles. The cramping would strike without warning, causing terrible pain in my legs. The pain was particularly bad in my hamstrings as I climbed the hills. 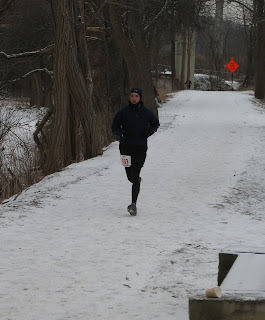 All in all, I cannot say that running the Winter Buckeye Trail 50K was the most enjoyable experience of my life on the trails. But being the first to cross the finish line certainly was a sweet moment and a great opportunity to build experience as a competitive ultrarunner. What really added to the sweetness was my wife and parents there at the finish line when I crossed in terrible pain from the cramping. My parents had never seen me run a race since my cross country days, and so having them there when I won my first event (and maybe the only event I will ever win) was certainly special. If nothing else, it was an opportunity for them to experience the camaraderie that makes the ultrarunning world so special and keeps me coming back for more.